Control the biggest and baddest bulls of the PBR! The goal is to shake off as many riders as possible while launching them at the scoreboard. Lay the board horizontal for beginners, or "Go Vertical" for an entirely different challenge! Let 'em fly individually, or add to the mayhem and everyone play at once! The first to successfully launch 8 riders gets bonus points! It's High Flyin' Fun! 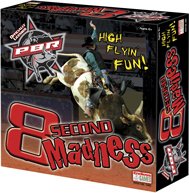 It's 8 Second Maddness! !